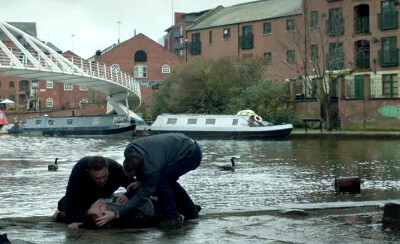 For based in Manchester, the producers were obviously aware of the many drowning in the canals of the city so staged their own to keep up with the trend. A couple of the actors walking over the bridge at Castlefields saw a man struggling in the water of the Bridgewater Canal, and believing he had fallen in, dashed down, with one jumping in and hauling him out, the man then being taken to hospital. But visiting the man in hospital the one who had pulled him out was rather surprised to learn that he was not being thanked for saving a life as the man was not a drunk who had stumbled in, as we all now is the most usual, but someone wanting to end it all. It is not expected that CaRT was amused, it publicising the drownings in its own canals.